I’m fussy about poaching pears. You have to be. For a perfect poached pear there are rules to follow: I can think of seven. Don’t go for heavily sugared poaching syrups – these must be avoided at all costs. Water enhanced with a little sugar, spice or citrus is just right and allows the natural flavour of the pears to shine through. The pears must be firm but on their way to ripening. They should still be green but have a slight give when pressed firmly. Prepare the syrup first so it comes to the boil BEFORE adding the fruit. The syrup, once the fruit is added, must be kept to a simmer – one of soft bubbles just breaking the surface. Watch over the pears as they poach – not like a hawk, more like a mother sneaking a peep on a sleeping baby. And if the syrup gets too hot and begins to bubble too much, simply pull from the heat, till the syrup cools slightly, and return to a gentle simmer. Once the pairs have become transparent, they are cooked. Remove from the heat and allow them to cool completely in the liquid. I know, it’s fussy right? But then, the fuss pays off. 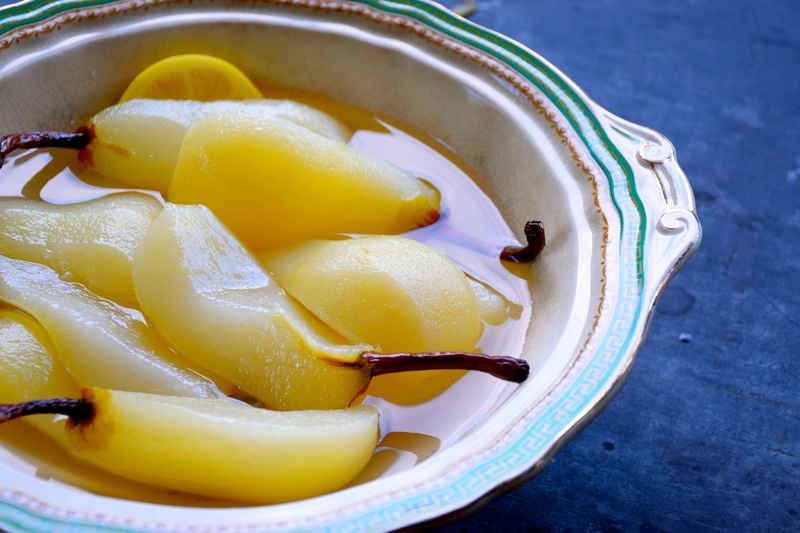 And you have a bowl of glistening poached pears that can be eaten in so many ways, like with muesli or porridge, with yoghurt or ice cream, bake them in a crumble, serve them in a salad, eat them cold, or eat them warm; Serve them on a cheese platter. Remember, never underestimate the fuss required for the prefect poached pear. Heat 1 .5 litres water in a large pot, add cardamon pods, sliced ginger, sugar and lemon, stir and bring to the boil. Meanwhile, use a peeler to peel the pears. 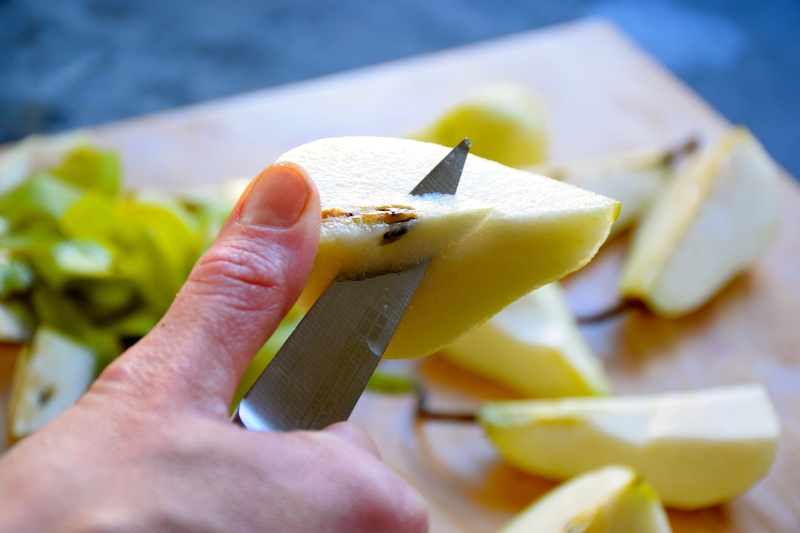 Cut pears into quarters, then use a small knife to remove the pips. Keep some of the stalks on the pears as these look great for presentation. Try to work quickly so pears don’t oxidise and turn brown. 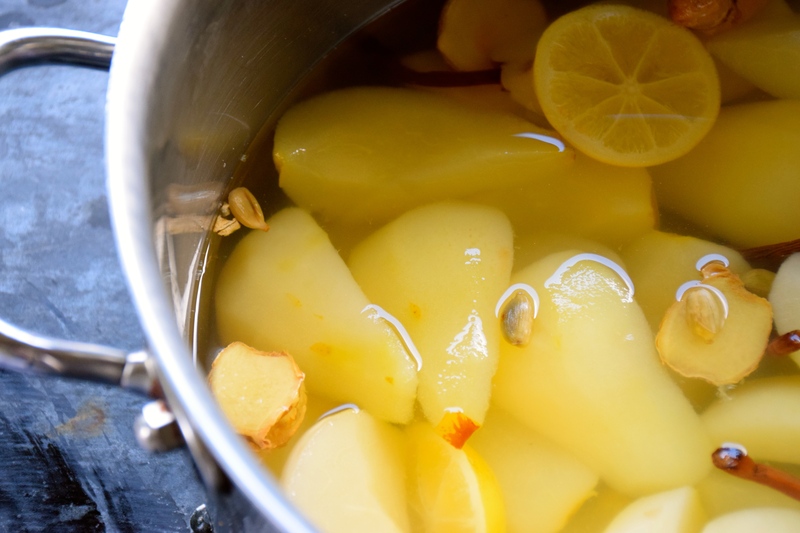 When all the pears are prepared place them into the boiled syrup, turn down the heat, cover pears with a sheet of baking paper to weigh them down and poach on a low simmer for 25 minutes. 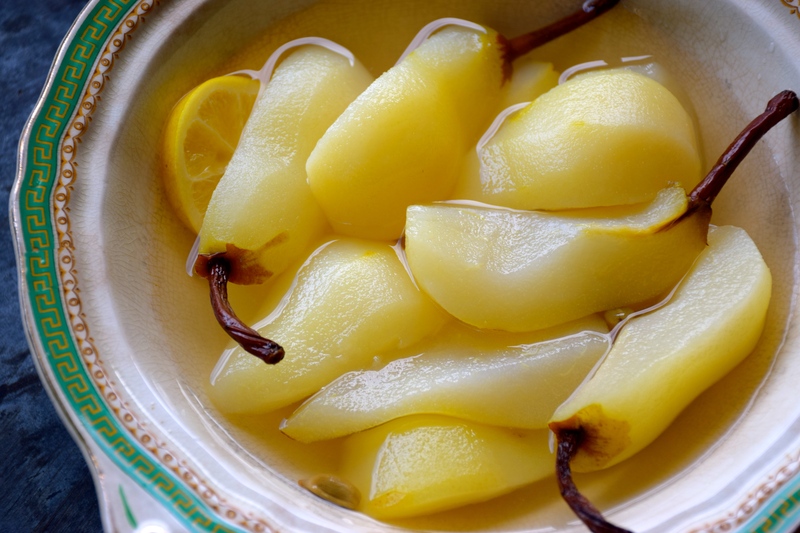 Turn off the heat and leave pears to cool in syrup. Once cool, store in air tight containers for 1 week in the fridge. Eat cold or warm. Your poached pears sound wonderful. I feel like I am really missing out because I have never made them. Your photographs are stunning! Thanks. It’s never too late to get cooking, or poaching for that matter! Happy anniversary! I think you’ll both enjoy these pears. Looks really good! 🙂 Where and how can I use them? Hi Mila, I’d serve them as a dessert with a dollop of creamy yoghurt.But they are equally good used in a pear crumble, or of course served with muesli or porridge. delicious. I’ll bet these smelt wonderful. You can’t go wrong with the smell of pear and cardamom.